Since the first market two weeks ago, I've been knitting up a storm! 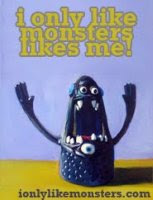 The result is 10 new monsters [8 of which have felt and locking safety eyes instead of buttons!] and 10 new ornaments. I also got new cards printed and they are super fun. Just like before, the cards are blank inside. They're super cute. Cards are $4 each or 3/$10. Here's a preview of some of the new monsters... and there are more pictures that I posted on the facebook page. Another note, do any of you guys instagram? I've been posting some pictures to that little app recently and welcome you to follow me on there. My username? You guessed it! erinmakesstuff!